The year is 1901—it's been twenty-three years since Peter and the Lost Boys returned from Rundoon. Since then, nobody on the island has grown a day older, and the Lost Boys continue their friendship with the Mollusk tribe, and their rivalry with Captain Hook. Meanwhile in London, Molly has married George Darling and is raising three children: Wendy, Michael, and John. 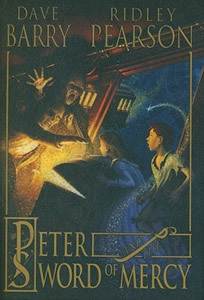 One night a visitor appears at her door; it's James, one of Peter's original Lost Boys. He is now working for Scotland Yard and suspects that the heir to England's throne, Prince Albert Edward, is under the influence of shadow creatures. These shadow creatures are determined to find a secret cache of startstuff which fell to London many centuries ago. The starstuff is hidden in an underground vault which has only one key: the Sword of Mercy, a legendary weapon kept with the Crown Jewels. Molly is determined to help, but when she suddenly goes missing, it is up to her eleven-year-old daughter, Wendy, to keep the starstuff out of the Others' clutches. She has heard her mother's stories of a flying boy named Peter Pan, and he may be her only hope in saving the world from a shadowy doom . . .